A few weeks ago we were visiting with our good friend Ken Riedl, who like us, enjoys Watertown history. As part of that conversation, we jumped in his car and toured a few spots in Watertown and ultimately one of them involved the site of an old railroad siding on the city's north side. We showed Ken some of the physical evidence of the tracks and that set a few things in motion. Oh, the tracks are long gone, but to this very day there are telltale signs that the track was there at one time. 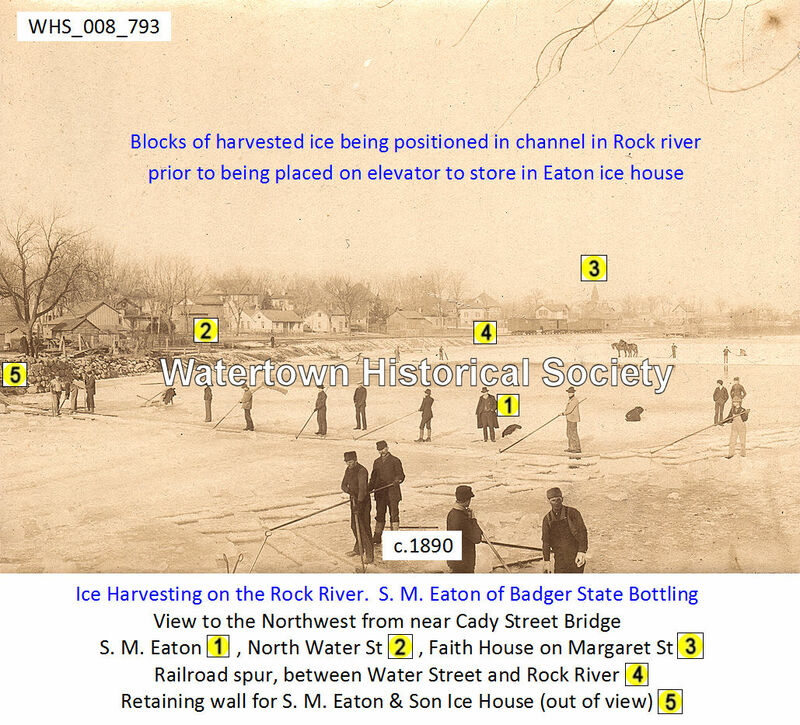 Ken became intrigued with that long ago era and we did a little research, including linking up with Watertown historian Bill Jannke as well as a few older folks who have firsthand knowledge of the siding. It was back in November of 1900 that the concept of a spur track that would service the Hartig Brewery located on the present site of Breselow's Family Market, was first discussed publicly. “It is rumored that a side track from the North Western railway to the William Hartig Brewery is a probability of the not too distant future. “This facility is needed to assist in the transportation of the brewery's product, which now has to be hauled by team to the railway stations, entailing a considerable item of expense. It wasn't long after that petition that there were some negative rumblings from property owners in the area, but the prevailing attitude at the time was that the brewery was an integral part of Watertown's economy and as such it should be allowed rail access. LaBelle Street is an open street from Spaulding Street south to the old track right of way. North Warren Street in that area was never opened nor was Berlin Street. The spur line started just to the east of the Church Street crossing on the edge of the present Redigas property. In fact it wasn't all that many years ago that this section of spur was still in operation there, although it went for only a short distance. We recall some years ago talking with Mike Haydock, Redigas owner, about the spur and he confirmed his firm did occasionally bring in freight cars of propane fuel on the siding. Then, maybe 10-15 years ago the line was rebuilt from Jefferson Junction to the south and Clyman Junction to the north. At that time the railroad surveyed every spur track owner, asking if they planned to make use of it. If it wasn't going to generate enough revenues, the railroad pulled the spur in order to minimize maintenance on the main line junctions with spurs, and that spur, along with many others, was pulled out. From there the line traveled east and down toward what is now known as Silver Creek. If you drive out on Spaulding Street and look south about where that tiny bridge over Silver Creek is located, you'll see the right of way, now fully overgrown with trees. Along the right of way there are some old ties that can be seen, but the rails, spikes, plates, etc., are all long gone. We have a variety of sources for this information, but Bill Jannke's private collection and Ken Riedl's research work was extremely helpful. In addition, you'll see there were several eye witness accounts of the spur. First a little background. The spur we're talking about was constructed around 1900. William Hartig, owner of Hartig's Brewery, had petitioned the city for installation of the spur. The spur line branched off the main line of the Chicago and North Western tracks just north of the crossing with North Church Street. It was on the edge of what is now the Redigas property. In fact, Redigas trucks turn in now on what at one time was the track bed. From there the track traveled east and down toward what is now known as Silver Creek. It crossed Silver Creek on an old wooden trestle, crossed Water Street just south of the Water Street Bridge and then turned south and went along the side of Water Street, continuing as far south at Rock Street. It actually was expanded to a double track spur from Margaret Street to Rock Street to accommodate all the businesses located in that area. The old wooden trestle that crossed Silver Creek is long gone, but for years the wooden pilings could be seen in the water. They are no longer visible but remnants of them can be found in a year when there is a drawdown of the river. And, the rail right of way is clearly visible if you travel on Spaulding Street near the Silver Creek bridge and look south. Back in around 1900 transportation had to be a huge issue for a company like Hartig's Brewery. Cases and barrels of beer were bulky and roads were probably not the best of shape in the city. Until the spur was built, Hartig would load his products on a wagon pulled by a team of horses and then taken to the train station at the foot of South Fifth Street or to the one just north of West Main Street. With this spur, Hartig would have to just take the load across the Cady Street bridge and over to the spur a couple blocks north on Water Street. Our longtime readers will recall the Hartig Brewery was located at the present site of Breselow's Family Market at the bridge on Cady Street. So, there was still some need for horse drawn wagons. But, Hartig had plans for that. 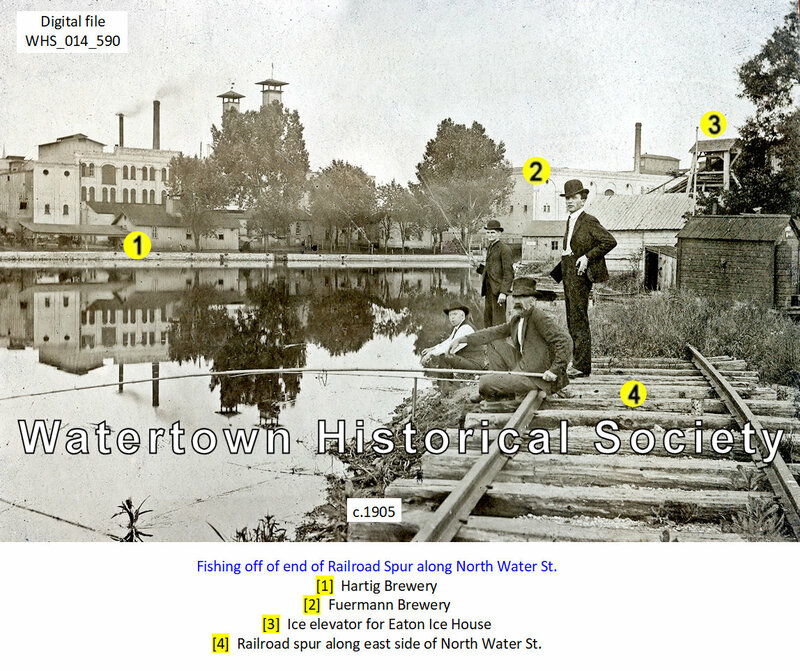 An article in the Watertown Republican toward the end of 1900 made mention that the next phase, after the spur was constructed, would be a bridge across the river right to the brewery. That article said, “From the foot of Rock Street a trestle bridge is eventually to be built across the river to the brewery.” That statement was a bit unclear as to whether that would be more of a foot bridge to carry smaller amounts of beer, or a little bit bigger to allow for horse-drawn wagons, or the ultimate which would have been a railroad bridge that would have served the brewery directly. We guess it makes little difference because the extension across the river never took place. Some records indicate the old Silver Creek clubhouse was located on property owned by the Chicago and North Western Railroad. It was leased to the people who organized the Silver Creek Club and constructed the clubhouse. The lease was for $5 a year. Eventually the railroad sold the land to the club for $75. It had offered all of its right of way between Water Street and the river to the club for an extra $150 but they couldn't raise the money. Imagine all those river front properties could have been purchased for $150. Based on today's interest in land on the river, the club would not have been short of cash. One of our longtime friends, Walter Uttech, reminisced a bit about his recollections of that spur. He said years ago there was an old mill at the foot of Rock Street where the tracks ended. Today a couple of homes are located there, but the mill no doubt made use of the tracks. Walter said the current location of Fanny P. Lewis Park was once Bartlett's Coal, Sand and Gravel Company. He said that company had a horse drawn wagon and the bottom of the wagon opened up to discharge the contents. No doubt the sand, gravel, etc. was transported to the property via the railroad. 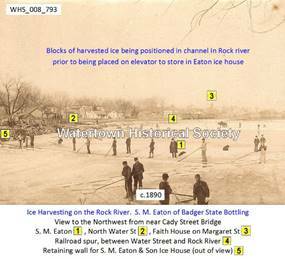 In later years, Walter said the old Knispel Ice House, Badger State Bottling, Klink Beer Distributors and several others were all located on land between Water Street and the Rock River and most of it was along the railroad spur right of way. Walter also mentioned that at one time his grandfather had worked at the mill when a Mr. Wertheimer owned it. After the mill closed down it was reopened for a while to make cereal. After that business ended, our friend said the building was used for storage and it ultimately burned down. Herb Uttech, who has lived adjacent to the spur right of way for about 65 years now, recalled the trains coming by on the spur, delivering coal and other goods to businesses on Water Street. His recollection was that the spur was used as late as the 1950s. He remembered back in the early years when he and his wife purchased the home at the south end of LaBelle Street most homes were heated with coal. He would often walk along the track and find chunks of coal. As we studied the old maps of that area, the railroad siding is clearly noted, but what we found surprising was that the maps do not show Silver Creek as being anything more than a small creek. There was no wide spot that we know at the Silver Creek pond today. As we looked at the map with several other people, we couldn't help but wonder if at some point the height of the lower dam was raised for some purpose. That would have backed up more water and maybe made the Silver Creek pond where the ice skating takes place. 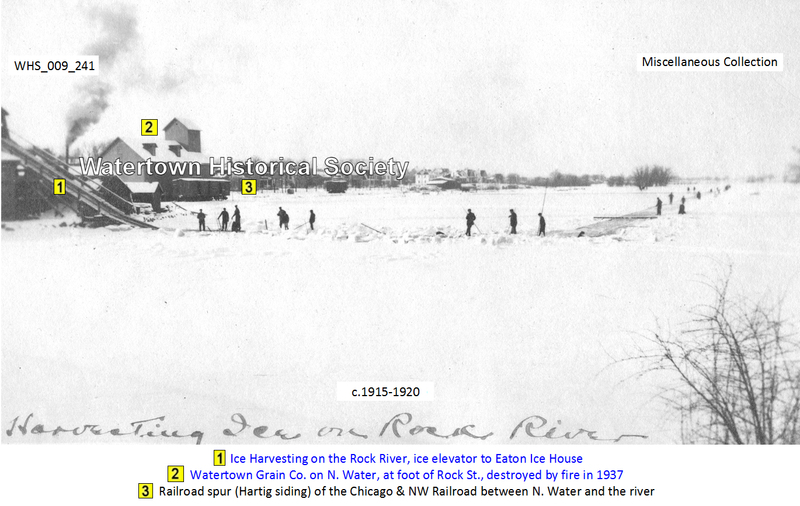 The map does not show that the railroad spur crossed any water. It skirts along the side of it so that remains a mystery. Herb said as far back as he can remember the Silver Creek pond was there, but he said it was very shallow and over the years there were a few times when it did dry up completely. But, he did remember the trestle that crossed the pond. Tom Schultz’s Times Square articles, full text, PART I; PART II < must have access to WDTimes E-edition to view.